To say the last couple weeks have been bad for mortgage rates (and consumers) would be an enormous understatement. In fact, over the past month mortgage rates on the ever fashionable 30-year fixed have risen nearly a full percentage point. We’re talking rates of around 3.375% in early May that have since rocketed to around 4.125%, with 4.25% in sight. The Mortgage Bankers Association released its weekly mortgage applications survey this morning, which revealed the largest single-week increase in rates since July 1, 2011. Yes, about two years folks. Their average contract rate for the 30-year fixed jumped from 3.90% to 4.07% for the week ending May 31, 2013, a sizable jump to be sure. That puts it at its highest level since April 2012 – rates for jumbo mortgages and FHA loans are also at their highest levels since May 2012. Keep in mind that FHA loans now also have mortgage insurance for life in many cases, so borrowing looking for such loans really missed the boat. Pretty much no loan program is exempt from the carnage, including the 15-year fixed and adjustable-rate mortgages. Put simply, the recent Fed minutes included talk of ending its stimulus program (QE3), and what seemed like a potential issue far down the road has gotten very real in just a short period of time. This has pretty much hammered refinance traffic, with applications falling 15% from a week earlier and now at the lowest level since November 2011. The refinance share dipped to 68% from 71%, its lowest level since July 2011. Not only does this hurt consumers, but it also puts a lot of loan originator jobs into question, seeing that banks and lenders took on extra staff to ease capacity constraints. And don’t expect purchase mortgages to pick up all the slack – they also declined two percent on a week-to-week basis, though they’re still up 14% from a year ago, not that that’s saying much. Panic or Keep Calm and Carry On? While it sounds like all-out panic mode, it could just be a really rough patch for mortgage rates, which seemed kind of invincible for a minute (that always leads to bad things). What really got them on their upward trajectory was a positive jobs report about a month ago. Then the Fed minutes added eve more fuel to the flames, and we are where we are. But this morning, a worse-than-expected ADP jobs report was released, which should translate to slightly lower mortgage rates. And the much bigger Employment Situation report will be released by the Bureau of Labor Statistics this Friday, which if also negative, could lead to a huge rally for mortgage rates. In other words, if all the recent economic optimism turns out to be short-lived, mortgage rates could begin to creep back down to where they were a month ago. The downside is that it always takes mortgage rates a lot longer to fall than it does to rise, as lenders are always cautious about lowering rates too much too fast. Still, bad economic news could also prompt the Fed to continue on with its mortgage-backed securities purchase program, which would be a double-bonus for rates. So there is still hope for mortgage rates, though they may never return to their all-time lows. However, anyone locking in a rate today should be more than happy if they look at the history of rates over time. But one should be extremely cautious in the current environment because mortgage rates are extremely volatile, and could rise even more if the jobs report turns out to be decent. 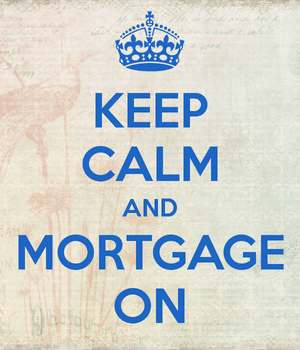 Read more: Should I lock or float my mortgage rate?